First you have to select the disk image you want to explore. You see some information about the saved disk at the time of Backup to help you to find the right image, should there be more than one. Additionally, you may choose the drive letter the virtual drive shall have; Drive Snapshot will automatically use the highest drive letter available (Z:). Click Map and Explore Virtual Drive to mount the drive and start the Windows Explorer on the drive. 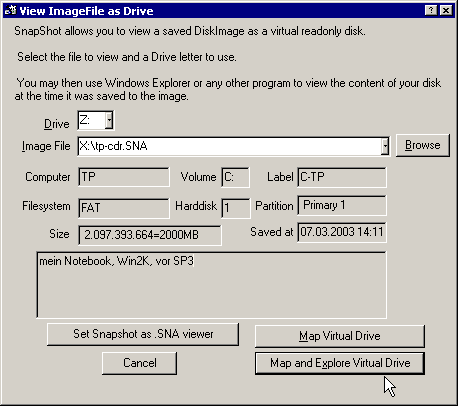 Click Map Virtual Drive to mount the drive only without starting Windows Explorer.